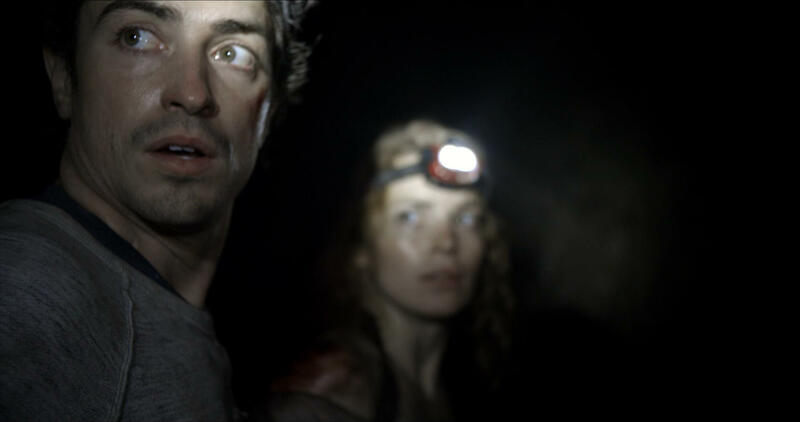 In taking on the role as lead actress via 2014's As Above, So Below, Perdita Weeks proves to be quite the siren. A sort of Welsh Katherine Heigl if you will, she is gorgeous, appealing, and effortlessly witty (just like the rest of the film's young cast members). She leads a group of treasure hunters, tour guides (sort of posing as foot soldiers), and a hesitant translator into the eerie Catacombs of Paris, France. That's the blueprint for this highly unoriginal horror film that tirelessly sledgehammers the aspects of the hand held, found footage genre. But to my dismay, it became moderately effective by plowing its way through a homage of everything from sci-fi drama to adventure comedy (I'm not kidding). After taking in a viewing, I even found a new tag line for its upside down poster: "As a movie, it sometimes glows." Has a nice ring to it don't you think? Anyway, containing no background music (but still dispensing a sense of doom and gloom throughout) and directed by Minnesota native John Erick Dowdle (he helmed the similar themed Quarantine back in 2008), this moderate box office misfire (at least in the U.S.) hones in on young, alchemy scholar Scarlett Marlowe (Weeks). Her father committed suicide long ago and now she's relentless on continuing his work by trying to find a philosopher's stone (one that can grant eternal life and turn base metals into gold and silver). This stone according to local legend, is located beneath caves in Paris called the Catacombs. So therein lies a mission. Scarlett pulls together a group consisting of a cameramen, a cocky tour guide (Papillon played by Francois Civil), the tour guide's best friend in Zed (played by Ali Marhyar, who does a goofy Robert De Niro impersonation), the tour guide's girlfriend (Souxie played by Marion Lambert), and a translator (Ben Feldman as George). From that moment on, danger and darkness ensue. You know by the time they enter those caves, bad things are bound to happen. By the way, it's sort of funny that the Weeks character needed a translator to figure out what was written on ancient rocks 1000 feet beneath the Earth's surface. She's educated, has a bunch of degrees, and speaks several languages (even ones that aren't used anymore). This is a minor oversight and shouldn't keep you from enjoying what's on screen. Now for the most part, this mild jolt fest is a cavalcade of different mystery/horror thrillers. If a human being is considered a mutt (someone of many different racial descents) then As Above, So Below is the movie equivalent of said mutt. It copies off of everything from The Blair Witch Project (characters in "As Above" get lost in Catacombs like the characters in "Witch" get lost in the woods) to The Shining (the hotel in The Shining has haunting, hallucinatory images just like the caves in "As Above" which channel a similar vibe) to The Goonies (both flicks have the whole treasure hunting shtick going on) to Paranormal Activity (they both contain around-the-corner scares where the camera cuts this way and then that way plus plenty of video documentation) to The Descent (The Descent has zombies where as "As Above" has ghosts, but both exercises deal in the aspect of claustrophobia) to Flatliners (both films deal with a human's darkest fears, a past that continues to haunt them, and demons on the other side that know their business). And along with plenty of random imitations, As Above, So Below even has the token side character (Benji portrayed by Edwin Hodge) who's role is slapdash playing the falling-behind-and-getting-hurt cameraman. Its also got the token heroine who can't leave well enough alone but is spared at the end because she's well, the main protagonist. And finally, there's everyone saying stuff like the familiar, "we gotta keep moving" or "you're crazy, you can't go in there" or my personal favorite, "oh my God". Like I said, this is probably not the freshest horror vehicle out there. But it plods along nicely and is done with just the right amount of solid, technical skill. Oh and if you don't suffer from motion sickness (I'm basing this on the abundance of jittery camerawork), then "As Above" should provide you with one heck of a ride. But being the snobbish critic I am, I kinda wish this thing wasn't found footage fodder. I mean this is the one of those films that didn't really need the hand held camera treatment. There's no clear consistency of what is being documented nor who the footage is being documented for (except for maybe Scarlett's own, personal instrumentation which seems trivial). And for the record, this exercise reminded me of Into the Storm which came out earlier this summer. Watching both films made me ponder what was actually being videotaped and what was you know, movie movie. What a headache (there also happened to be cameras on people's heads, really?). As for the film's rollicking third act and its ending, well it's exciting, heart-pumping stuff even though it leaves you confused by the time the final credits come up. I won't give anything away only to give you one hint: Look again towards the film's poster (as mentioned earlier). This might give you a clue. In conclusion, of all things I thought the script for "As Above" had an intelligence to it and a certain je ne sais quoi. The characters didn't talk rubbish and fill my head with your typical, supernatural mumbo jumbo. It's currently at a Redbox kiosk so you might as well check it out. Result: A harmless 3 stars.